See New York City's historic playground, cradle of amusement history, and summer beach scene. Just down the boardwalk is Russian-inflected contrast. In summertime, as the saying went, "Coney Island was the world." In the 19th century, it was the playground of the wealthy, the home of the first indoor prize fight, and the place where the hot dog and the roller coaster were invented. Not long after the turn of the century, Coney housed the world's most spectacular amusement parks, harbingers of modernity in a rapidly industrializing world: Dreamland, Luna Park, Steeplechase. To visit the beach, you had to rent a locker at a bathhouse and use the associated strip of sand. When the subway arrived in 1920, delivering millions of people a season, the "nickel empire" democratized: the boardwalk was built, the beach opened to all, and some of the most famous attractions--a few still extant--were built. The Wonder Wheel, an unusual Ferris Wheel with interior cars that slide as the wheel rotates, was built then. It still operates, part of a smaller though still vigorous amusement district, a terrific place to visit on a warm summer day. Coney Island declined after World War II, thanks to (among other things) suburbanization and shortsighted planning, as housing projects were concentrated/isolated in space formerly occupied by summer bungalows, but its gritty heart remains. In fact, Coney has revived in part, thanks to the new stadium for the Brooklyn Cyclones and the dogged work of those in the amusement industry (and the nostalgia industry). Check out these entertaining introductions for the annual Coney Island Hot Dog Eating Contest. Recently, a rezoning promises enormous changes, while some humble but historic buildings have already been demolished. Our walk through Coney will be a trip among ghosts--empty spaces will evoke lost empires or, perhaps, a roller coaster famously seen in a Woody Allen movie. 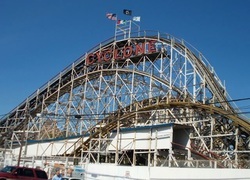 Still, a heck of a lot remains, from Nathan's to skee-ball to the Parachute Jump (Brooklyn's "Eiffel Tower," not functioning but nicely restored), to the still thrilling Cyclone, the world's most iconic rollercoaster. There's a restored carousel. There's a new rollercoaster. In 2016 came a new outdoor music venue and in 2017 a nicely restored restaurant complex. Superstorm Sandy left severe blows, visible if we leave the boardwalk area, and we should, since blocks away from the beach provide a more full sense of the neighborhood. On summer days, thanks to the ocean breeze, Coney's cooler than the rest of the city. And it has what I believe to be the city's best pizza. We can end with a walk through the adjacent neighborhood of Brighton Beach to the east, the center (but no longer the exclusive province) of Brooklyn's large Russian (more precisely "former Soviet," given the presence of Ukrainians, Georgians, Uzbeks, etc.) community. There are numerous sit-down and takeout food options in Brighton, as well as shopping opportunities, such as a Russian bookstore. A section of Brighton Beach includes some impressive art deco apartment houses. Option before/during/after tour: Nathan's hot dogs and other Coney food. Come early for Totonno's pizza. Option during tour: go on a ride! Best time to visit: Note that the Coney Island season--when most attractions are open daily, and crowds are largest--lasts from Memorial Day through Labor Day, plus additional weekends in September. If we visit at other times, we can get a sense of the landscape, but not a full feel for Coney. Please note: rides in Coney generally open at 11 am or noon, depending on the day of the week and whether it's "high season" or not.